A 234-kilowatt solar array that will power the Silt water treatment plant is nearing completion. The array cost the town $3,500 in advance fees, and will save an estimated $102,000 over the next 20 years while meeting 100 percent of the plant's annual electric use. SILT — Crews are setting foundations, erecting racks and installing solar panels in a wave of activity at the Silt Water Treatment Plant. The 234-kilowatt solar array is slated to be in service and powering the plant by Dec. 31, according to Katharine Rushton, commercial sales associate for Sunsense Solar. The new solar array will offset 100 percent of the plant’s electrical use on an annual basis. It’s being financed with a power purchase agreement and renewable energy credits from Xcel Energy, so it cost the town just $3,500 in upfront fees. The solar system will save the town an estimated $102,000 over the next 20 years, or about 15 percent of the plant’s total annual electric costs, and it will lock in electric rates for 20 years. Work on the project started Nov. 3. 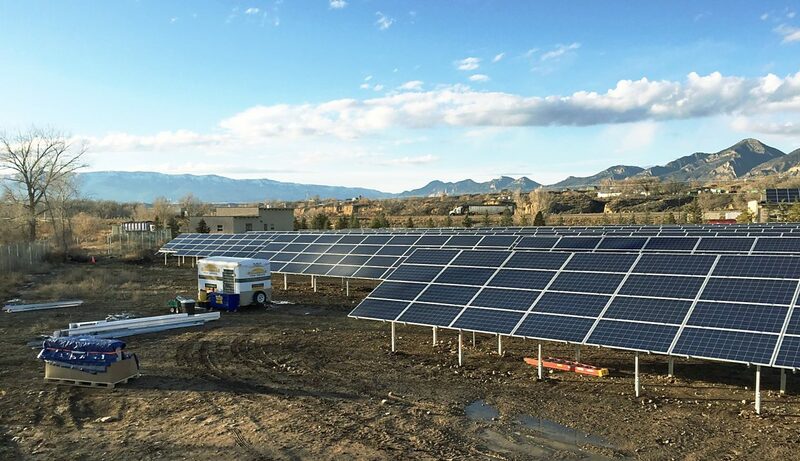 It’s the first of three major solar energy systems being installed in Garfield County in 2014 and 2015 by Sunsense, a Carbondale solar developer and contractor. Together, the systems will add up to 1 megawatt of renewable energy capacity. Next up after the Silt project are arrays that will power the Battlement Mesa Metro District water treatment plant and Roaring Fork High School in Carbondale. The Silt array includes 756 solar panels, each capable of generating 310 watts of electricity. A bank of eight inverters will convert the direct current electricity to alternating current, so the power can be used by the plant’s equipment or fed back onto the Xcel Energy power grid. Facing a tight, two-month timeline, the crews are closely following each other for all three phases of building the ground-mounted array, Rushton said. The foundation contractor, Lyons Fencing of Rifle, set the footers. The Sunsense crew erected the framework and solar panels, and is now finishing off the electrical wiring. Expert Electric of Rifle is handling the alternating current aspects of the project. Sunsense is also partnering with Garfield Clean Energy to install an energy data logger at the plant as part of the project. It will measure electricity use and solar production in 15-minute intervals for display on the Garfield Building Energy Navigator website. “Silt’s water plant operators have not had access to this detailed level of energy data until now,” said Mike Ogburn, energy engineer with CLEER, which manages the services of Garfield Clean Energy. “We were able to take advantage of the on-site electricians and some used equipment to get live energy data for the plant at a very low cost. The information will allow other communities to save money on their water treatment operations.